Circuit de Nevers Magny-Cours, which has a capacity of 90,000, is a motor racing circuit located in central France, near the towns of Magny-Cours and Nevers, some 250 km (160 miles) from Paris. It staged the Formula One French Grand Prix from 1991 (succeeding Circuit Paul Ricard) to 2008, and the 24-hour Bol d'Or motorcycle endurance events from 2000 to 2014 (succeeded by Circuit Paul Ricard). In 1992 it hosted the French motorcycle Grand Prix. Magny-Cours has hosted several international championships, like the World Sportscar Championship, World Touring Car Championship, FIA GT Championship, World Series by Renault, Formula 3 Euroseries and Superbike World Championship. Also, the FFSA GT Championship has visited the circuit since 1997. Usually dubbed Magny-Cours, it was built in 1960 by Jean Bernigaud and was home to the prestigious Winfield racing school (École de Pilotage Winfield), which produced drivers such as François Cevert, Jacques Laffite and Didier Pironi. However, in the 1980s the track fell into disrepair and was not used for international motor racing until it was purchased by the Regional Conseil de la Nièvre. In the 1990s the Ligier (and, after Ligier was bought, Prost) Formula One team was based at the circuit and did much of its testing at Magny-Cours. It had hosted the French Formula One Grand Prix since 1991, and the Bol d'Or since 2000. The circuit was re-designed in 2003 and used for a wide range of events include various sports and commercial use. For the 2003 event, the final corner and chicane were changed in an effort to increase overtaking, with little effect. This did, however, change the approach to strategy at this circuit as it made the pitlane much shorter. Because less time was lost making a pit stop, Michael Schumacher was able to win the 2004 French Grand Prix using an unprecedented four-stop strategy. In 2006, Michael Schumacher became the first driver ever to win any single Formula One Grand Prix a total of 8 times and at the same circuit. 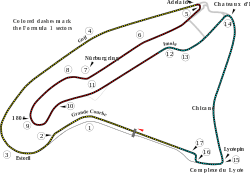 The 2008 race was to mark the last French Grand Prix at Magny-Cours, as the French Grand Prix had been indefinitely suspended from the Formula One calendar. Bernie Ecclestone originally confirmed that F1 would not return to Magny-Cours in 2008, instead moving to an alternative location possibly in Paris. However in a striking U-turn, it was revealed that the 2008 French Grand Prix would take place at Magny-Cours with the release of the official calendar in July 2007. In June 2008, the provisional calendar for the 2009 season was released, and a French Grand Prix at Magny-Cours appeared on it, scheduled for 28 June. However, in October 2008 the 2009 French Grand Prix was cancelled after the French Motorsports Federation (FFSA) withdrew financing for the event. In 2009 the track hosted its first Superleague Formula event. It also hosted a second event in 2010. The circuit was used as part of stage three of the 2014 Paris–Nice cycling race, with the peloton completing almost a full lap of the circuit – in the reverse direction to its motorsport use – before the finish on the front straight. The track nowadays is a smooth circuit with good facilities for the teams, although restricted access prevents spectators from reaching many parts of the circuit. Unusually, many corners are modelled on famous turns from other circuits, and are named after those circuits, e.g. the fast Estoril corner and the Adelaide hairpin. It has a mix of slow hairpins and high-speed chicane sections which includes a long fast straight into the first-gear Adelaide hairpin, the best overtaking opportunity on the circuit. The circuit is very flat with negligible change in elevation (only a small valley at the Estoril corner and a slight hill near the Lycee corner). The circuit provides few overtaking opportunities, despite modifications in 2003, which means the races here are commonly regarded as quite uneventful. Formula 1 races at Magny-Cours tend to have a processional nature, with most overtaking occurring during pit stop sequences. More varied racing occurs when it rains, such as in the 1999 race, which was interrupted by a downpour. After a restart, most top contenders developed problems, which paved the way for Heinz-Harald Frentzen to claim a surprising victory in his Jordan. Although the Bol d'Or 24-hour motorcycle endurance race was held at Magny Cours for several years, it never quite matched the cachet of the Le Mans event; the Bol D'Or has since returned to the more popular Bugatti circuit at Le Mans. ↑ "Magny-Cours". race-game.org. 2006. Retrieved 2009-11-16. ↑ "Ecclestone: No more races at Magny-Cours". autosport.com. 2008-05-12. Retrieved 2015-09-07. ↑ "Archived copy". Archived from the original on 2010-01-15. Retrieved 2010-01-12. ↑ "Stage 3: Toucy to Circuit de Nevers Magny-Cours". Paris–Nice. Amaury Sport Organisation. Retrieved 11 March 2014. ↑ "FFSA GT Championship Magny-Cours".